You can imagine the shock – it’s Halloween, the houses are expecting kids dressed up as ghosts and ghouls to turn up and demand sweets with menaces, when who arrives? A couple of steampunks with a brass-plated Gatling gun foaming steam! It could be worse. You could get a kid in a Jar Jar Binks costume, I suppose. Clever – too bad you can’t actually walk around with it because the tank is so damned big. Maybe if he could get the tank into a back pack?? 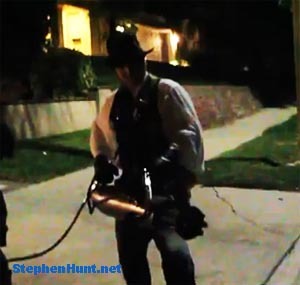 As the builder of the Steampunk CO2 Gatling Gun, I want to let you know, that it is portable. The tank is in a rolling backpack, it is a little heavy for doing a lot of walking. We didn’t feature it in the video because it wasn’t that interesting. The CO2 line has a quick-release and the barrel of the gun will run on its own without it. My son Alex, and I spent a little over a month designing and building the working unit. We had some help in some of the areas where my tools were not up to the task. We just got it all working on the night before Halloween. It was a tremendous amount of work. But we are very happy with the result. We hope to have a “making of” site put together soon. My son was the hit at his school and in our neighborhood.